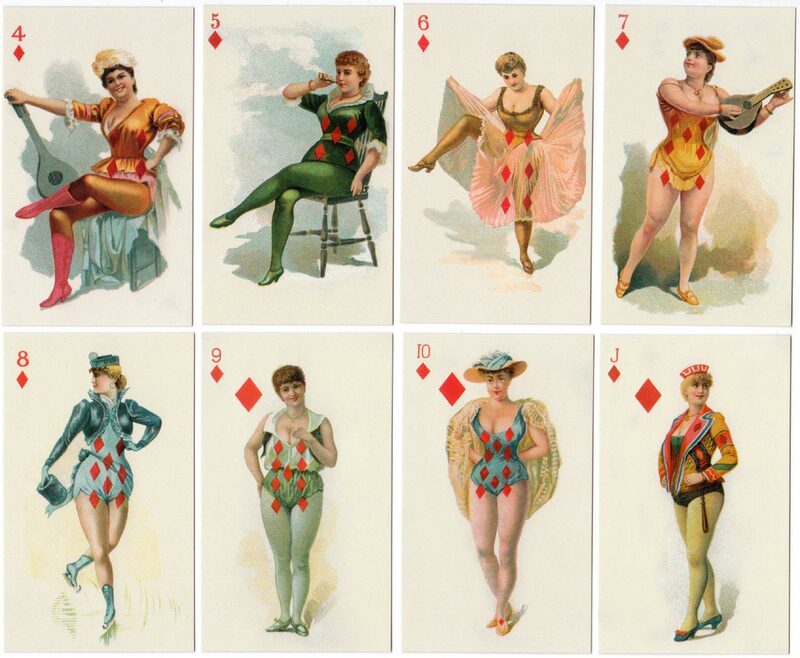 Above: “Hard-a-Port Cut Plug” tobacco insert playing cards published by MacLin-Zimmer-McGill (USA) c.1890, featuring a selection of beautiful actresses from a past era, in poses some might consider risqué. 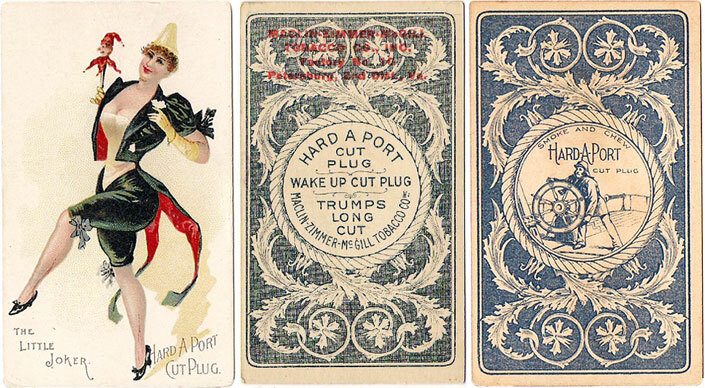 This set of designs was used in around six different editions with various backs advertising “Hard-a-Port Cut Plug” and/or “Trumps Long Cut” chewing tobacco. They were originally produced by Moore and Calvi, then by their successors MacLin and Zimmer and Maclin-Zimmer-McGill in around the 1890s. Collectible insert cards were a marketing innovation which started in the nineteenth century. Most of us will be familiar with these from our own childhood. Subjects varied from theatre or cinema stars and actors or statesmen, to animals, butterflies or birds, aircraft, garden flowers or playing cards. 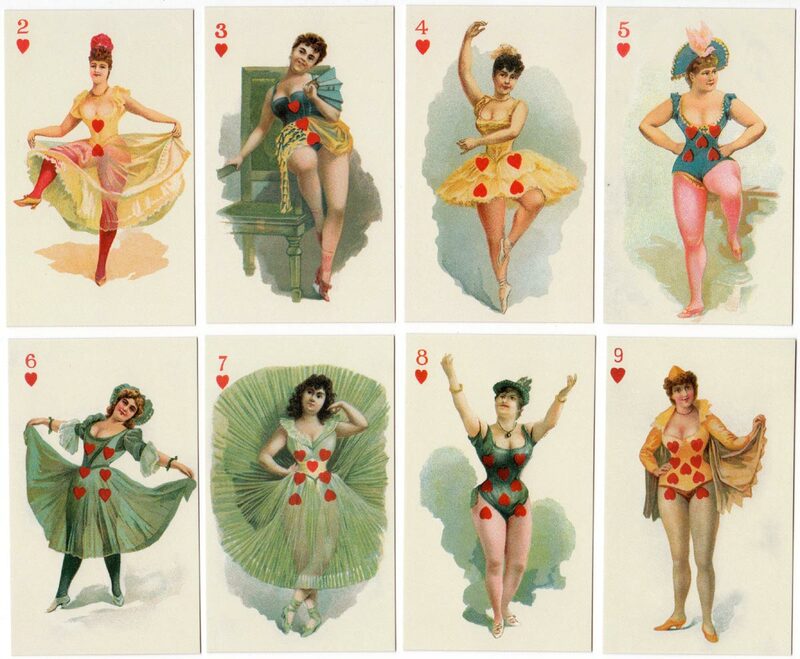 Cards were included inside tobacco products, chewing gum, tea, chocolate, match boxes, magazines, etc. In some cases they were not necessarily aimed at children but were aimed at the collecting urge in the average person. The “Hard-a-Port Cut Plug” series depicts actresses with angelic faces dressed for the pantomime or dance hall. 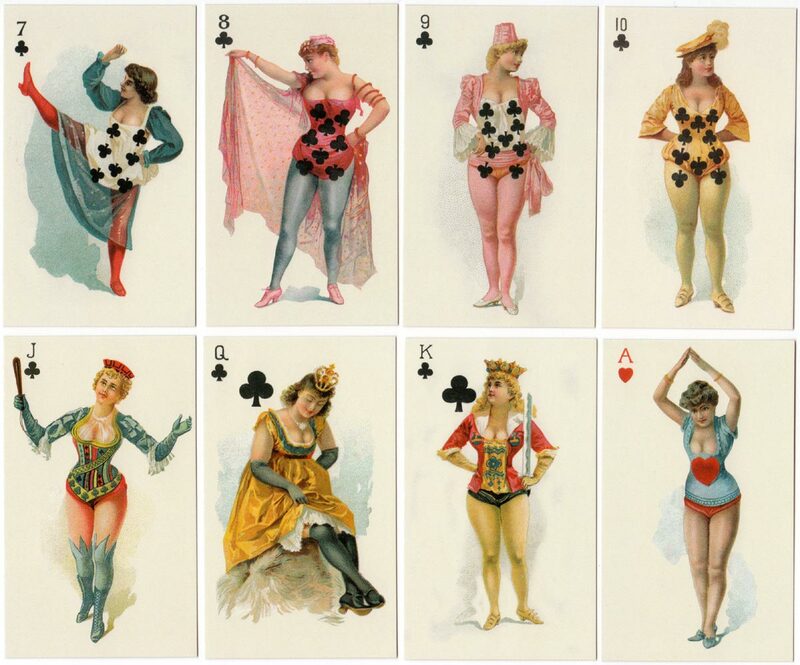 The costumes mostly have a playing card theme, and the court cards wear crowns or hold swords or other symbols of office. 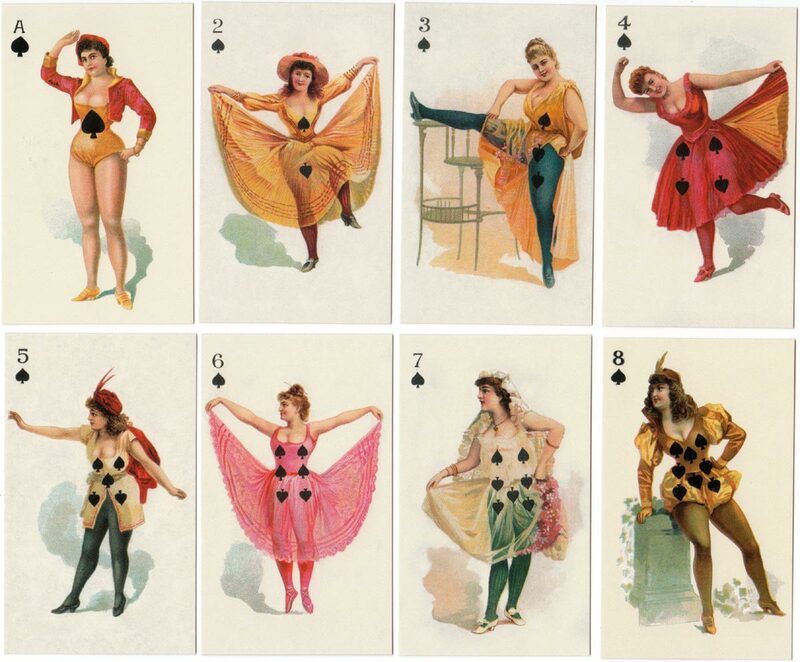 The Aces and numeral cards have the suit symbols superimposed over the costumes. Plug tobacco is a form of loose leaf tobacco made for chewing. Chewing tobacco was the most prevalent form of tobacco used in the United States until it was overtaken by cigarette smoking in the early 20th century. The pin-up girls from the “Hard-a-Port” set were re-published in 2003 by F.G. & Co., a company owned by Gianna Majzler and Darren Calkins. Above: selection from "Risqué Beauties" taken from the "Hard-a-Port" set and re-published in 2003 by F.G. & Co. Images courtesy Rex Pitts.